NEWTONVILLE - Walnut Street doesn’t seem the likeliest spot to celebrate the West Coast coffee culture in the Boston area. But Nikolas Krankl, the owner of Taste Coffee House, has already attracted national attention for his skills as a barista. Krankl bought an existing coffee shop in March 2008 and renamed it. He invested in high-end equipment - including a fully manual Synesso Cyncra machine manufactured in Seattle (the only one in Massachusetts). But he did little else to redecorate the cozy space. In the first year he owned Taste, business increased 100 percent over its predecessor. In Brookline, Maks Milstein opened the bright, sleek Cafe Fixe on Beacon Street, across from the Starbucks in Washington Square, almost a year ago. He does not consider his neighbor to be a competitor. “The culture of an espresso bar is one of the hardest things to bring,’’ he says. The newest entry in the market is Sip Cafe in Boston’s Post Office Square. Open in April, Sip occupies the space previously inhabited by Milk Street Cafe, then Z Square in the Park. These entrepreneurs are determined to reproduce the kind of casual coffeehouses, which take the drink very seriously, that have opened in cities like San Francisco and Portland, Ore., and have a devoted following. It’s a culture in which friendships are formed and businesses are started. Largely self-taught as a barista, Krankl came in second in the Northeast Regional Barista Competition in Pennsylvania in February, and competed in the United States Barista Championship in Portland, Ore., the following month. In the first round, he placed 18th out of 50. “I had a blast and learned a ton,’’ he says. He uses terroir beans from Acton-based George Howell Coffee Co.; barismo, a small-batch roaster in Arlington; Intelligentsia from Chicago; Ritual Coffee Roasters in San Francisco; and Ecco Caffe in Sonoma County, Calif., and assorted others. “We are constantly sourcing new coffees from other roasters,’’ Krankl says. At Taste, drinks are written on a blackboard along the wall in the seating area; the limited menu includes pastry, crepes, and sandwiches. You can order several espresso drinks; drip coffee, cafe au lait, and iced coffee, plus a handful of specialty drinks and tea, beer, and wine. Some purists would say the diversified menu - the fact that it serves food at all - means Taste isn’t a true coffeehouse. But there is nothing lacking in Taste’s devotion to coffee. After 3 1/2 years, Milstein, 32, left the Public Defender’s office and went to work at Northampton Coffee in Northampton, where he learned the intricacies of making espresso and espresso drinks, and how to run a shop. He wanted to open his own shop, and learned that the Beacon Street space was available. Milstein modeled Cafe Fixe on Northampton Coffee. The small room has light walls, blond wood, tables with high stools and funky music in the background. The atmosphere is hip, rather than cozy. Drinks at Cafe Fixe are smaller than other places because, Milstein says, “you can’t put enough espresso in a 20-ounce cup. No healthy person should be able to drink that much.’’ Cafe Fixe serves pastry but no other food, and Milstein has no plans to expand his menu. And he will never put whipped cream or flavored syrups in a coffee drink. “I offer a coffee experience, not a sugar-free vanilla experience,’’ he says. Owner Jared Mancini of Sip got into the coffee business almost by accident. 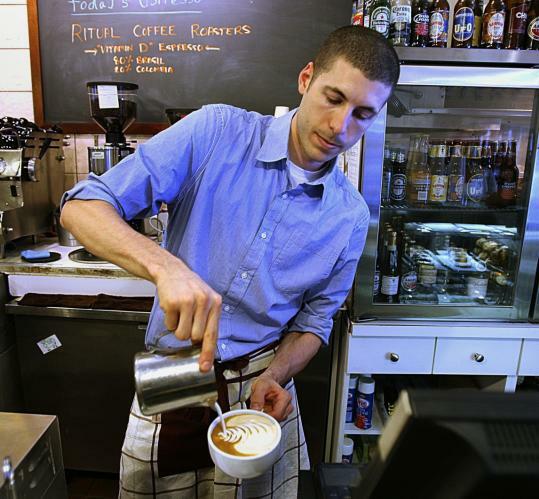 About nine years ago, he took a job as the manager of Torrefazione Italia, a small cafe on Newbury Street. When he went for his interview, he had his first latte. “I had never tasted coffee like that,’’ he says. Torrefazione Italia’s owners were from Italy, so “it was about the espresso,’’ says Mancini, 34. Working there for five years, until the shop was acquired by Starbucks, Mancini received a comprehensive education in the art of coffee. He wanted to make Sip “a coffee destination,’’ he says. The spacious, glass-walled cafe is inviting and attractive. Mancini uses single-origin beans from George Howell Coffee Co. for both espresso and drip coffee. “With single-origin, it’s harder to mask defects, but you can bring out lively, more complex flavors,’’ he says. He has a Marzocco machine that is almost fully manual. In addition to drip coffee and a full assortment of espresso drinks, Sip offers iced specialty drinks, like its shakerato, espresso over ice with a little bit of natural sugar, shaken, and teas. The cafe also serves pastry and sandwiches (the latter made on-site). But coffee is the real reason Mancini opened Sip. And the reason these three newcomers just may succeed in turning our city-by-the sea into a coffee town.